Stretch first using the stretches below. Then roll out all of the areas you worked during the workout and anything else that feels tight. Pigeon Pose – Sit on the ground and bring one foot in front with the knee bent to about “11” or “2” on the clock. Feel a stretch in the glute of the front leg. Straighten the back leg back as much as possible and rotate the leg and foot to point inward toward your body. Then relax over your front leg. Hold and then switch. 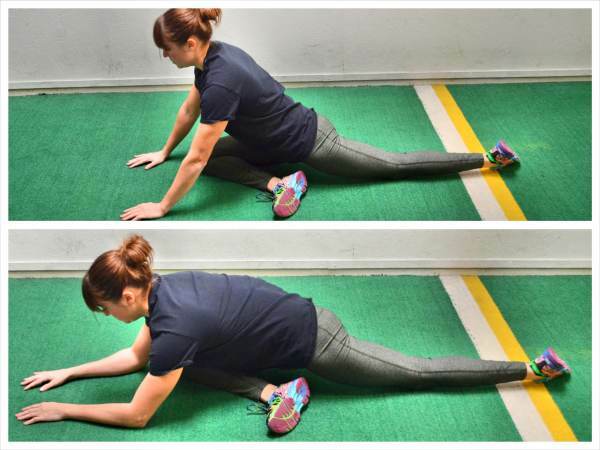 Star Stretch – Bend your left knee to about 90 degrees and pull it across your body. Place your right hand on top of your knee to press it toward the ground. Then relax your left arm open, trying to touch the back of the hand down to the ground. Try to open up the chest as much as possible without letting the knee move the ground. Relax and breathe then switch sides. Lying Glute Stretch – Lay on your back and cross one foot on top of the other knee. Then bend that knee in toward your chest with the ankle crossed over it. Grab behind your hamstring or your lower leg to pull the knee in toward your chest as you relax your head and upper back onto the ground. Relax and hold and then switch to the other side. Child’s Pose – Kneel on the ground with your toes pointed. Sit back on your heels reaching your arms out on the ground overhead. Walk your hands out as far as possible. You can also walk your hands to the right and left to get more of a stretch down each side of your back. You should feel this stretch down your arms and the sides of your back. You should also feel the stretch in your low back if you are relaxing back onto your heels. Kneeling Hip Stretch – Half kneeling on the ground, lean forward so that you feel a nice stretch down the front of the back leg. Then reach your ams up toward the ceiling and backward. You should feel a stretch all down your side and through the hip of the leg that is back on the ground. Hold then switch to the other side. Seated Hamstring Stretch – Sit on the ground and tuck one foot in toward your crotch as you stretch the other leg out in front of you. Relax over the straight leg and try to reach your foot with your hands. Reach as far down the leg as you can so that you feel a nice stretch down your hamstring and calf. Hold and relax into the stretch and then switch. 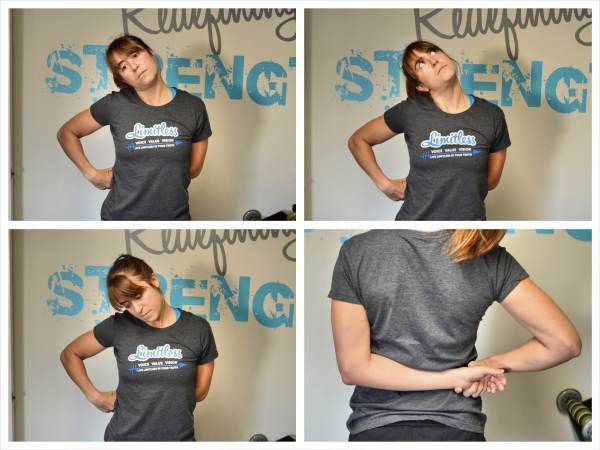 Standing Chest Stretch – Using a door or wall, place one hand back on the wall or doorway and turn away from the hand on the wall or door. You should feel a nice stretch on that side of your chest. 3-Way Neck Stretch – Reach one hand behind your back and then grab that wrist with the other hand. Pull the arm behind your back toward the opposite side. Then lean your head to the side you are pulling to. Do not tense your shoulders and bring them up toward you ears. Relax into the stretch. Then change the direction of your gaze. Look up and hold for a second or two. Then look straight ahead. And then look down. Move your chin as you look and not just your eyes. Changing the direction of where you look, will change exactly which muscles in your necks and upper back that you stretch.